Shortly before the Kyushu Tournament, two upper-ranked Mongolian wrestlers came to blows while drinking with their compatriots during a jungyō (regional tour) in Tottori Prefecture. The recipient of the beating, Takanoiwa, missed competing in Kyushu and is also hors de combat in the New Year Tournament. Takanoiwa’s assailant, yokozuna (grand champion) Harumafuji, dropped out on the fourth day of the Kyushu Tournament and by the end of November had ignominiously been forced to quit the sport. He was also arraigned on charges of assault with injury, and on Jan. 3, a Summary Court fined him ¥500,000, in the equivalent to a plea bargain. 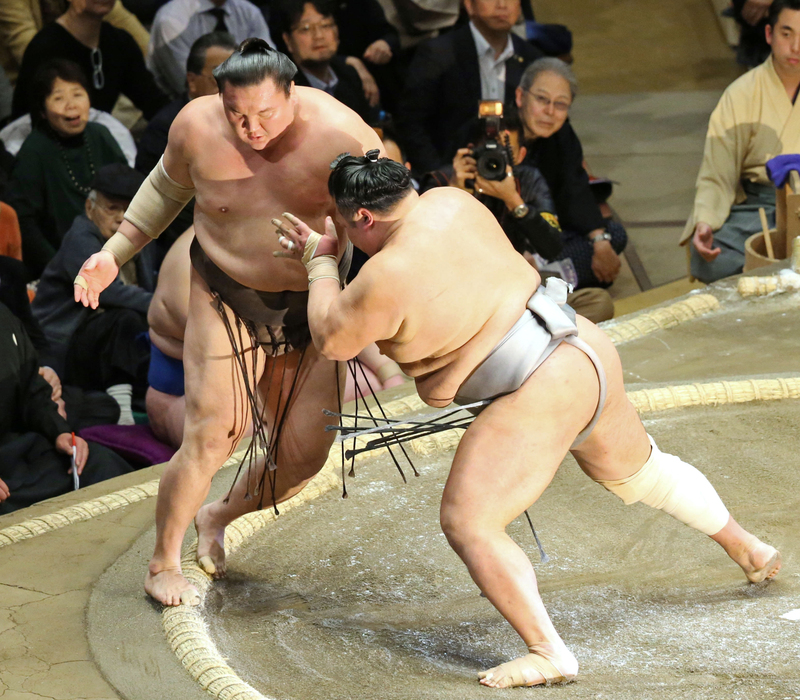 Takanoiwa’s stablemaster, Takanohana, broke sumo’s version of omerta (code of silence), where public airing of internal disputes is frowned upon, spurring blanket coverage in the sports tabloids and weekly magazines. 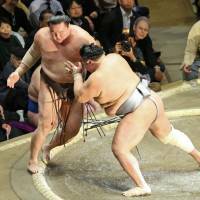 As a result, sumo’s woes have dominated the news cycle for the past two months. Aside from openly voicing his wariness over what he sees as creeping Mongolian influence in the sport, Takanohana is something of a rebel among his peers in the sumo association. Asahi Geino (Jan. 25) introduced the “three pacts” he has proposed to change the sport and make it more popular to the public, including re-arranging seating at the sumo arena, with reduced ticket prices for children; setting back TV broadcast times on some days to feature bouts in the evening, so that salaried workers can view them live after returning home; and reducing the influence of the tanimachi (wealthy backers) to allow more participation by fans, among others. In the end, a majority of directors sided with Hakkaku — agreeing that Takanohana was out of line — and voted to demote him two ranks in the association. Like the gentle sport of sumo, however, this is not a knockout blow, and Takanohana may possibly make a comeback by the time the next board is voted in. Depending on who’s reporting, it’s not easy to figure out who’s wearing the black hat, but it’s clear more criticism is being directed at Mongolian yokozuna Hakuho, who won his 40th tournament victory — an all-time record — in Kyushu with an outstanding 14-1 performance. Despite his success — or perhaps because of it — Hakuho’s popularity has been waning and some commentators are beginning to suggest that he retire while his reputation is intact. Others are inclined to accuse him of playing too rough, and offer some compelling evidence: Videos of his past bouts have been repeatedly shown on TV “wide shows,” in which he springs out of a crouch with an elbow smash that gave his opponent a bloody nose. An article in Flash (Jan. 30) demanded the association warn Hakuho not to engage in three moves considered “unbecoming” to a yokozuna: dame-oshi (to push an already defeated opponent); kachi-age (leading with an elbow thrust); or harite (slaps to the face). One day into the New Year Tournament, Nikkan Gendai (Jan. 16) ran a full-page article on its back cover predicting Hakuho might withdraw. The gist of its story goes that the aging yokozuna is hard-pressed to compete against up-and-coming gachinko (earnest) grapplers, and is at a disadvantage when he can’t fall back on rough play. Nikkan Gendai also implied that Takanohana’s condition for a “cease-fire” is for the clique of Mongolian wrestlers (known as the mongoru gojokai, or mutual assistance association) be disbanded and predicted the weeklies were winding up to publish more dirt on Hakuho. Sure enough, four days later Shukan Bunshun (Jan. 25) broke a sensational six-page story that accused Hakuho of being a “key man” in arranging fixed bouts. As predicted, Hakuho pulled out from the New Year Tournament on Thursday after suffering toe injuries, the Japan Sumo Association said. Some blame was also directed at Takanoiwa, the initial victim in the current fiasco. Shukan Asahi also noted that Takanohana sent out a strange email to his followers that appeared to appeal to nationalistic sentiments. Such patriotic declarations notwithstanding, Shukan Asahi noted in an ironic tone that the association has been notified that the Emperor won’t be attending the New Year Tournament.